It is 20 Myr old and is the first species described as a dolphin fossil in Argentina and Patagonia in one century. The dolphin is small -two meters long- and was baptized Aondelphis talen, which means small dolphin from the south, because it was found in the province of Chubut. “Although the remains were fragmentary, the ear bones allowed us to identify a new species”, Mariana Viglino, doctoral fellow, affirms. She is a member of the Grupo de Paleontología y Paleoambientes del Neógeno Marino Patagónico of the Instituto Patagónico de Geología y Paleontología (IPGP-CONICET). This animal -which inhabited the Patagonian seas about 20 Myr ago- belongs to the Platanistoidea superfamily, a group that was quite diverse in the past according to the great number of fossil species found so far in different parts of the world. Nevertheless, in the present, this group is represented only by one species Platanista gangetica: the Ganges River dolphin from India. “This animal provides a new piece to address the evolutionary question of how a group that used to be highly diverse 20 Myr ago currently presents only one species and does no longer live in the sea, neither in the southern hemisphere nor in the rivers of the northern hemisphere. 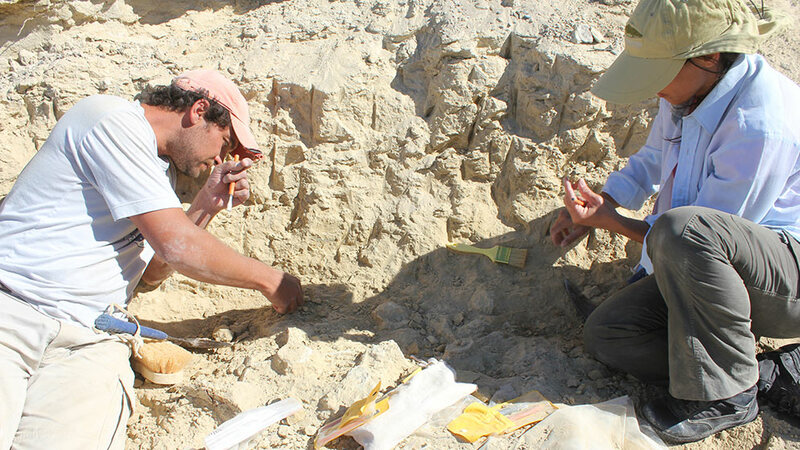 The fossil record of this group found in the last decades in Patagonia is very relevant for science”, Viglino explains. The anatomical characteristics of the skeletal remains of this dolphin suggest that the Aondelphis talen had the capacity for echolocation, a vital feature of current dolphins. “For these animals, from the adaptation point of view, the hearing ability is limited and allows them to perceive the surrounding through the echo produced in the objects after the sound dolphins emit to guide themselves” Buono describes. She is an assistant researcher at the IPGP-CONICET and member of the group. This multidisciplinary team in which Viglino and Buono participate aims at obtaining additional information not only about the animal they found but also about its environment. That is why they are conducting geological studies. “The analyses of the sediments in which the remains were deposited are going to provide accurate information as regards their age, environment and fauna. We also find great diversity of invertebrate such as mollusks, echinoderms, crustaceans, among others. There is a great variety of fauna that inhabits the same environment of this dolphin and provides useful information”, José Cuitiño explains. He is a geologist and assistant researcher at the IPGP-CONICET and member of the team.